ERBIL, 16 July 2014 (IRIN) - Concern is growing over how the semi-autonomous government of Iraqi Kurdistan is managing its borders amid reports that vulnerable families seeking refuge are being refused entry or forced into transit camps along ethnic lines. In the days after militants of the Islamic State of Iraq and the Levant (ISIS), seized control of Iraq’s second city Mosul in early June, some 500,000 Iraqis of varying ethnicities streamed into the northern Kurdistan region seeking shelter in a mix of hotels, mosques, schools and parks. However, in recent weeks, aid workers say that access has been tightened and fewer displaced people are being allowed in. According to NGO staff working at the border, checkpoints are regularly closed and thousands of people are kept waiting for long periods - in some instances up to five days - without information and with limited access to shelter, food and water. There is also, rights groups say, a trend of different access rules being applied based on people’s ethnicity and religion: Kurds and Christians, or those who have sponsors inside Kurdistan, are able to pass relatively easily, but generally Sunni and Shia Arabs and Turkomen are being stopped or sent to temporary holding sites. She added that while UNHCR staff were carrying out protection monitoring and distributing non-food items at the checkpoints, the sites were managed by KRG, not UNHCR. Discussions were ongoing with the authorities and other UN agencies, she said, to resolve the issues and create a formal system of registration for the internally displaced persons (IDPs). On 11 July, when IRIN visited the Khazair checkpoint, near the town of Kalak on the border between war-torn Nineveh Province and the relative security of Kurdish Erbil Province, tempers frayed under a hot sun as a long queue of cars awaited their chance to cross. Children, pregnant women and the elderly crouched under sheets of material pinned to a wire fence in a crude attempt to find shade, while men thronged at the front, jostling for water, food and information, none of which were immediately forthcoming. Abed,* 41, a Shia Turkoman from Tal Afar, a town 50km west of Mosul which has been the scene of fierce fighting between ISIS and Iraqi security forces, said he had been stuck at the crossing for over a day. “We have disabled people and a pregnant woman with us but they won’t let us cross the checkpoint,” he said. “We don't want to go to a camp and we don't want to stay in [the Kurdish capital] Erbil, we just want to be able to go south,” he said, referring to plans to fly from Erbil to Baghdad or other relatively calm southern cities. Next to the checkpoint, on the Nineveh side of the border, is a tented site also called Khazair, which was full to bursting with mostly Sunni Muslims from around Mosul, many families sharing tents and complaining about the lack of shade and sanitation. According to a 3 July report from REACH, a research initiative established by the NGOs ACTED, IMPACT and the UN Operational Satellite Applications Programme (UNOSAT), close to half of the IDPs at Khazair were there because they had been refused entry into Kurdistan. However, it was largely a different story for Shia Muslims, who were not being moved into Khazair camp, but instead being taken to a transit site close to the Kurdish capital Erbil, to wait for flights out of Erbil International Airport. Planes are now the only way to get south to cities like Baghdad and Najaf due to insurgents controlling the main road routes. 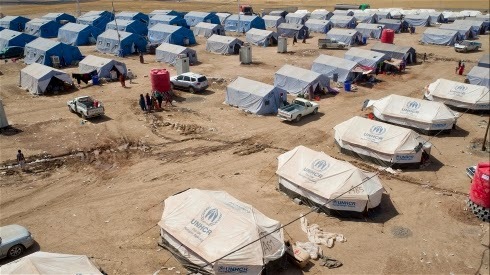 Last week, some 3,000 mostly Shia Turkomen from Tal Afar were relocated from the Khazair checkpoint to Baharka camp, 5km north of Erbil city, according to an 11 July report from the UN Office for the Coordination of Humanitarian Affairs (OCHA), which recently set up an office in Erbil to respond to the mass displacement. Those people have since left by plane to other parts of the country, the report said, but the United Nations was not involved in organizing these flights. IRIN visited Baharka in the past few days and found around 6,000 people who had been brought there by truck from the Khazair checkpoint the previous evening by Kurdish police and soldiers. The former agricultural site, in a remote spot surrounded by fields, has some tents (initially erected in 2013 to host Syrian refugees) but most people were sheltering from the sun inside a cavernous concrete warehouse. The open-sided building was cluttered with old farm equipment, and families had laid bedding inside fenced squares that resembled of animal pens. Civil servant Abu Azzam, a Shia Turkoman, told IRIN how he, his wife and five children had spent two days at Khazair checkpoint before being transferred to Baharka by armed officers. Like many of those who fled ISIS in Tal Afar, the 43-year-old’s family went first to the town of Sinjar near the Syrian border, but after weeks of sleeping rough on the streets and in warehouses, decided to head to Erbil to try to fly to Baghdad and other Iraqi cities. “We are hoping to go to the south to Baghdad or Najaf but we have no money so we are hoping for a plane from the Iraqi government,” he said, adding that he left Tal Afar before receiving his salary and did not know when he would be paid again. Despite repeated efforts over 10 days, IRIN was unable to get a response from KRG officials about their access policy. In an interview last month Dindar Zebari, the deputy head of KRG’s Department for Foreign Relations (DFR), who is leading the IDP response for the government, said it was up to Kurdistan’s security services to manage its borders and that it was too soon to be setting a policy on IDPs. Donatella Rovera, Amnesty International's senior crisis response adviser, said a more comprehensive strategy was needed. Sheri Ritsema-Anderson, a humanitarian affairs officer at OCHA, agreed there were concerns about entry and access into Kurdistan. “We are discussing access issues with the KRG,” she said. “We are working with the government on this and there is a lot of liaison going on at multiple levels,” adding that that those people who did not get through were still getting aid. “The KRG has demonstrated tremendous hospitality to displaced people over the years and during recent weeks. However, there is a concern from local authorities and communities about how many more they can accommodate,” she said. On 1 July, Saudi Arabia announced a contribution of US $500 million towards the UN’s response in Iraq. The money is a significant and welcome boost for UN country teams who for months have been struggling with a lack of funding. This pledge is likely to soften KRG's access restrictions, one aid source said, as the Kurdish government gains confidence that it will not carry the financial burden of hosting the IDPs alone.